Some time ago we wrote a whitepaper on a project that we have started, with a matrix structure which is used according to the Tandem technology. This technology is a proprietary system of the German company T-Mould and is based on the use of two separate sub-areas in a mold, wherein the cooling time is used to be able to make more efficient use of (Rompa's) injection molding machines. 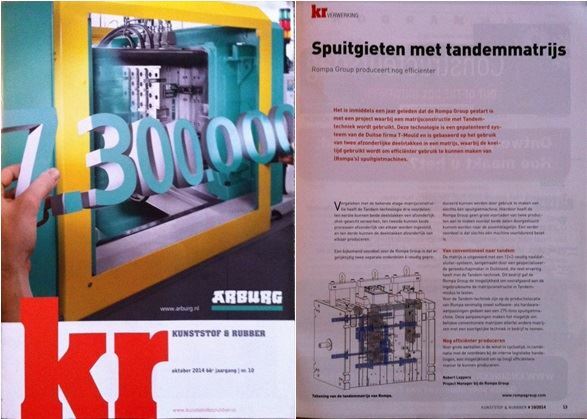 The whitepaper was picked up by the leading Plastics & Rubber magazine (in Dutch: Kunststof & Rubber) and it recently appeared in their October edition. Of course we are very happy with this! Want to read the full tandem techology whitepaper? Please contact us and we will send you a copy.